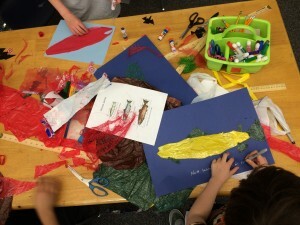 As a Teaching Artist, Nancy engages students in a practice called arts integration in which students engage in a creative process which connects an art form with subjects in other curriculum areas. 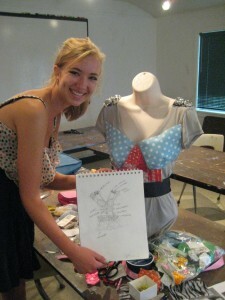 Nancy works with classrooms and youth groups constructing recycled art and fashion- “trashion”- as a positive and interactive lens to view issues related to resource use, climate change and the future of human habitation on the earth. Below is one sample lesson geared to 6-8 grade students, is fashion based, and uses T-shirts, in which students create individual projects. This lesson plan can be easily altered for different age groups or to work with different materials. In this lesson students learn about the environmental and social impacts of the fashion industry and how to be a conscious consumer. Additionally, we explore how to use fashion as a means of creative individual expression through making upcycled wearable garments.